With less than a week to go before President Trump is scheduled to meet with President Putin in Helsinki, the State Department has decided to renew its pressure campaign on Western businesses invested in Russia's Nord Stream 2 pipeline to Germany. According to Reuters, the State Department has doubled down on previous warnings to Europe, most recently in May when Trump gave Merkel an ultimatum to drop the Russian gas pipeline, and has been "making it clear" to firms involved with "the Russian energy export pipeline sector" that they're at risk of being sanctioned. "We have been clear that firms working in the Russian energy export pipeline sector are engaging in a line of business that carries sanctions risk," a spokesman for the U.S. State Department told Reuters. "We believe it (the pipeline) would undermine Europe’s overall energy security and stability by providing Russia another tool for the political coercion of European countries, especially Ukraine. Russia understands that this project is dividing Europe, and is using that to its advantage." The warning comes after President Trump accused Germany of being a "captive of Russia" because of its dependence on the pipeline for LNG, unleashing a diplomatic scandal ahead of his official NATO visit. Five prominent Western firms have invested in the pipeline - Wintershall and Uniper, in Germany, OMV in Austria, Anglo-Dutch Shell (a British-Dutch multinational) and Engie of France. Should the State Department follow through with its threat, the EU has threatened swift retaliation (given that Germany isn't the only European country that's energy-dependent on Russia). That's also why the EU has warned against moves in the US Congress to escalate sanctions with Russia (though the US media would have you believe that Trump is the true source of resistance). The point that Trump made earlier about the pipeline undermining NATO is actually the official position of the State Department. It also happens to be correct. 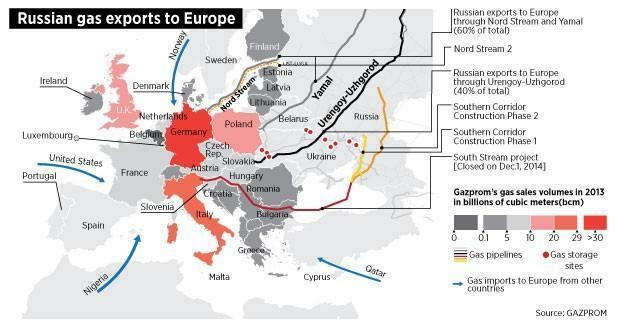 Germany and much of Europe are effectively held hostage by Russian energy exports. While the US media reports that Trump himself is undermining NATO by meeting with Putin, there are probably more than a few EU energy ministers who were relieved at the prospect of their meeting.